Image at the end of day. The fire has spread to 54,000 acres and is 5% contained which means it is still totally out of control. 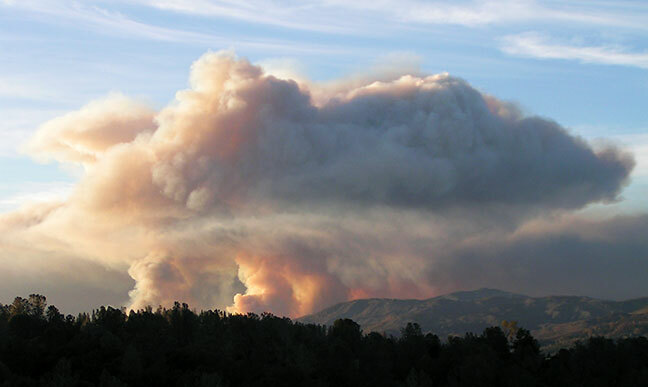 The latest report from Cal Fire says that the estimated containment is August 10. 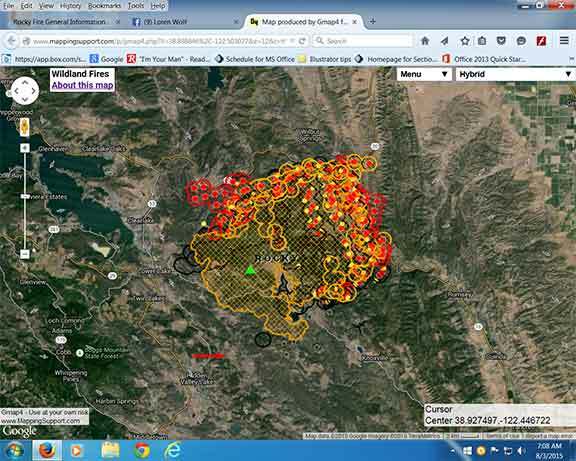 Map of the Rock Fire taken at 7:00a.m. August 2, 2015. Today the wind is blowing out of the south-west and to the north-east. This is good for me but the fire advancing toward Hwy 20 and Hwy 16. All the residents in the north-east end of the county are in great trouble. I also think of the horrendous suffering that must be taking place for all the wildlife trapped in this fire. I pray to the Goddess for mercy for all living things in front of the fire and for the homes of the people who are in its path. Things are getting tedious out here. I am constantly on the alert. I had to unpack the car because I have to bring hay to the goats twice a day. The boxes are stacked around the house in case I have to quickly load them back into the car. I have to ask myself why am I staying here with the imminent threat of fire. Around me most everyone has left. They return only to feed their animals. I find this totally abhorrent. If it is too dangerous to stay why leave your animals? What do you think is going to happen if the fire reaches them? So I stay because it is more comfortable here than at a hotel. I stay because I have no place to put the animals. 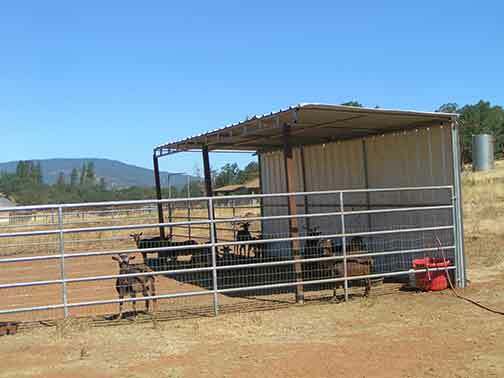 The goats are taken care of. They have been evacuated. But the 8 chickens, 2 cats and 2 dogs and one old San Clemente buck will fill my car. I stay because this is home and I want to protect it as long as I can. I know that if the fire is coming I will have to get out of here. With all these trees I cannot hope to save this place at the end. But I will stay as long as I safely can. Meanwhile little is getting done. Most of the day is spent driving out to feed the goats where they are evacuated. The car is holding together but I have to fill it with coolant before I leave each time or it will overheat. Sometimes I can catch a little sleep but mostly I am on the edge ready to make the call to abandon this place. PG&E has come by and sprayed all the power poles with red fire-retardant. 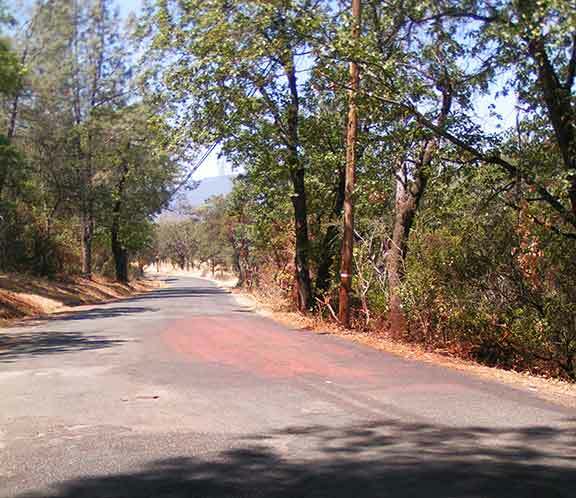 Fire-retardant sprayed on road and around the power poles. 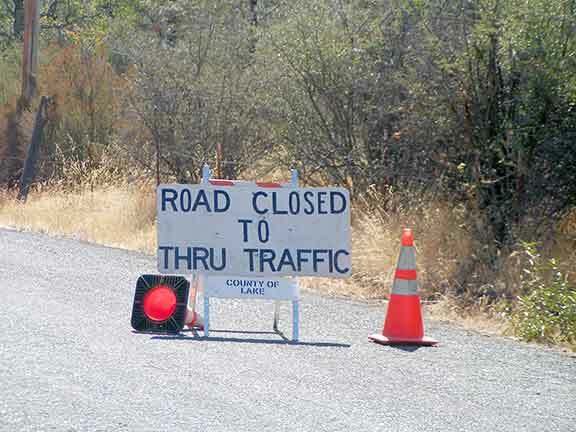 The fire department put up a sign that says Road Closed To Thru Traffic. Of course this road does not go thru so they must have borrowed the sign from some other road. I was stopped once by one of the firemen at the road sign. I had to show him my electric bill with the street address on it. After that they recognized me enough to wave me through. The first image in this post was taken from the driveway this evening on August 2, 2015. See you all tomorrow. Posted on August 3, 2015, in Caretaking the Forest, Dragons, Psi Keep Center for the Arts, San Clemente Goats, Uncategorized, Unforeseen Events, Wildfires and tagged art center,, grassland conservation, grassland management, psiKeep center for the arts, san clemente island goats, wild fire. Bookmark the permalink. Leave a comment.